At the time of writing this newsletter, a precarious 72-hour ceasefire had just begun between Hamas and Israel. We have been following the news closely from a variety of sources and wishing the carnage would stop. We have also been feeling completely powerless. Given how acerbic many of the reactions in social media have been, our first instinct was to stay quiet. Every word is charged right now, anything posted can cause a visceral reaction, and then the war plays out on social media. We are heart-broken for all the victims no matter who they are and appalled by the carnage and destruction in Gaza. This is not a war of equals, and lasting peace depends on addressing the root causes of the conflict, such as ending occupation, and addressing justice and security for both sides. At the end of the day those left standing will negotiate an agreement and shake their heads and wonder why they couldn’t do this before all those lives had been lost. In this day and age, when there is so much peace-building and conflict-prevention wisdom amongst us, it is inex-cusable to be using violence as a means to a peaceful end. 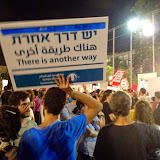 Tel Aviv, July 26, 2014, Credit: Gadi Kenny. There is another way, and this is what many of the Peace itTogether youth-made films have intended to convey over the past ten years. In spite of some critics saying that the film Grave Digging portrays the conflict as balanced or equal, we highlight this film today, for its poignant portrayal of the futility of violent conflict. Stories of Palestinians and Israelis working together and/or reaching out to help each other. Links to articles, videos and other media that challenge the status quo and reflect upon or propose and alternative peaceful path. Please feel free to send anything that fits into the above categories our way, and we may share them with others.